I am typically not one to jump on board with trends -- especially food-related trends. But when I stumbled across a Facebook page full of home cooks raving about the Instant Pot Programmable Pressure Cooker, I was sucked in immediately. 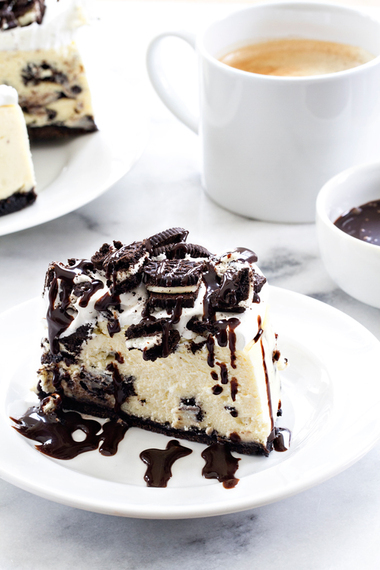 Instant Pot Oreo Cheesecake may be the easiest cheesecake you'll ever make. It's the perfect size for a small family celebration too! I've always read wonderful things about pressure cooking, but I'm kind of a pansy and the thought of cooking anything under pressure conjured up very scary, messy things in my head. So when my Instant Pot arrived, I turned to my friend and fellow blogger, Barbara, who writes Pressure Cooking Today, for some advice. Barbara recommended that I start with pressure cooking water. Yes, water. And much to my surprise, the process was easy and most importantly, nothing blew up in my face. Total win, so I moved on to hard boiled eggs. Baby steps. And let me tell you, pressure cooked hard boiled eggs are pretty much perfection. No yucky green ring around the yolk and the shells slipped off like magic. I was instantly Instant Pot obsessed. Since Eric and I both work from home, you'd probably think that our meal planning game is pretty strong, but that's most definitely not the case. We're often scrambling at 5:00 to come up with something to feed our little family, so the thought of quick, one pot, home-cooked meals sold me. I love slow cookers, but honestly, with both of us home all day, by dinner time, I'm kind of over whatever dish I've been smelling all day. So the Instant Pot seemed perfect for remedying that problem. Also, the fact that you could supposedly make cheesecake in a pressure cooker definitely had a little something to do with the purchase. As soon as I saw everyone in the Facebook group posting perfect little cheesecakes, I ordered a 7-inch springform pan, and may have even paid for one day shipping with Amazon Prime. I told you guys I was obsessed! My first test cheesecake was perfectly cooked and had amazing texture. Creamy, but dense and not one single crack. However, it smelled faintly of the Kahlua Pork that I had made a few days before. You guys know that I love me some cheesecake, but pork scented cheesecake is something that I just couldn't get behind. Turns out the Instant Pot sealing ring holds odors like a magnet. An unfortunate fact I might have realized, had I read the instruction booklet cover to cover. 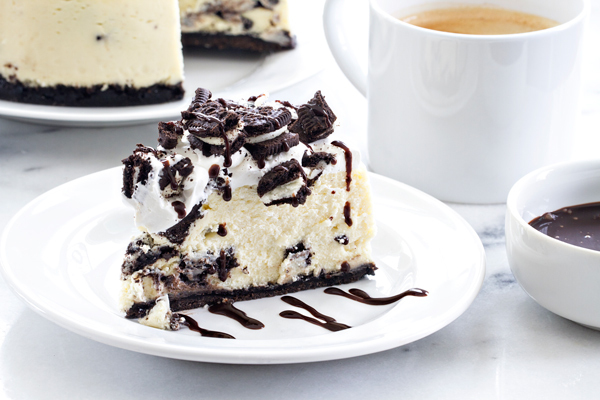 But after a little steaming with vinegar and lemon wedges, the smell quickly faded and I was whipping up this Instant Pot Oreo Cheesecake without a hint of pork. When the pan arrived, I got a good chuckle because the pan seemed so tiny in comparison to my 9-inch springform pans, but the size was absolutely perfect for the Instant Pot and our little birthday celebration for Elle. No leftover cheesecake hanging out in the fridge begging me to eat it, just 6 perfect pieces of cheesecake goodness, gone in one night. My friend Shelly of Cookies and Cups also whipped up a delicious Instant Pot Salted Caramel Cheesecake that you won't want to miss! 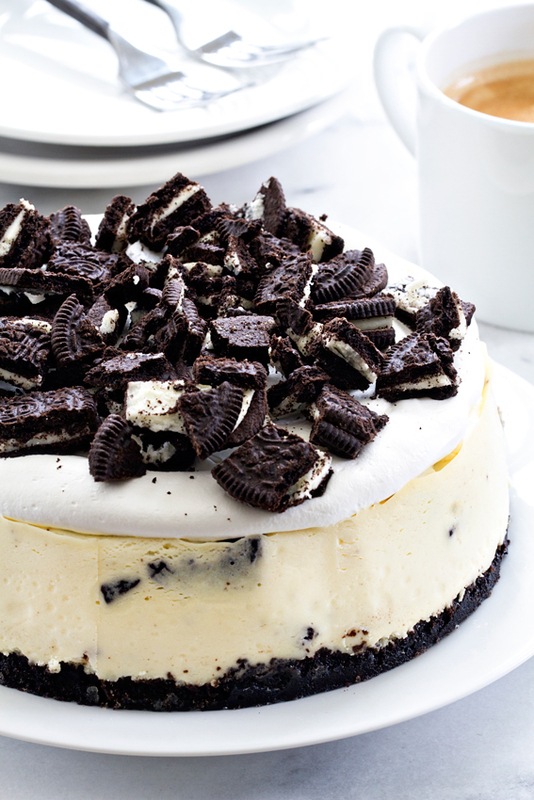 You could even make this cheesecake with the new Cinnamon Bun Oreos. I'm pretty sure that'd be amazing! Oh the possibilities, my friends! Looking for more delicious cheesecake recipes? Be sure to check out my Sugar Cookie Cheesecake and No Bake Oreo Cheesecake! Get the Instant Pot Oreo Cheesecake recipe!